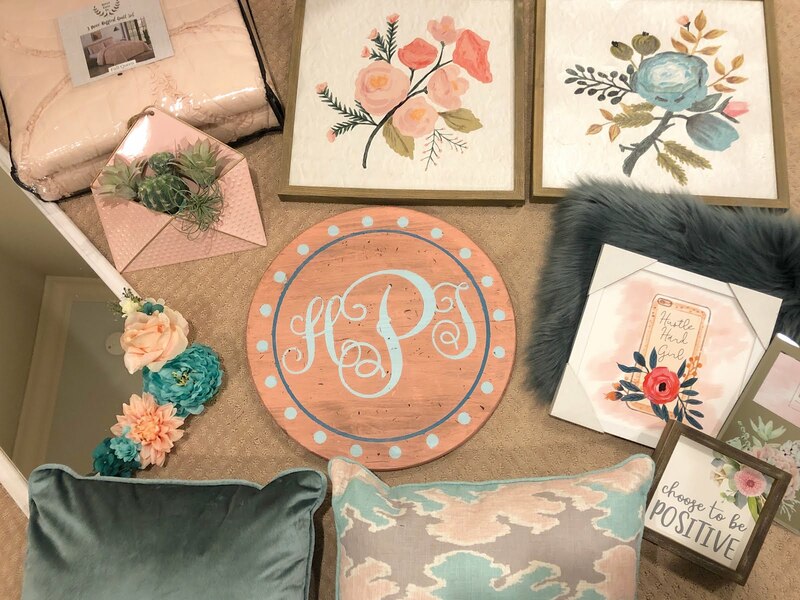 We're coming at you with two home decor posts in one week! Yesterday Jen shared about her kitchen remodel and today I'm talking bedrooms. My oldest decided a while back that for her birthday this year she wanted to redo her room. I was excited about this because it means I get to decorate a room! 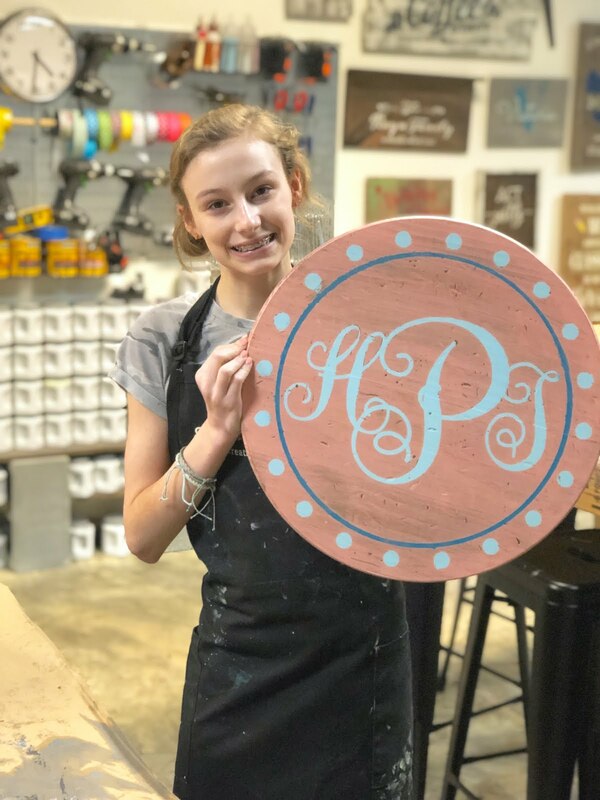 She has also recently declared that she thinks she wants to explore the world of interior design as a career so she has been really on board with helping plan her new room. She had a lot of ideas swirling around in her head so the first thing I did was set her up on Pinterest to search, browse, and pin everything her heart desired. 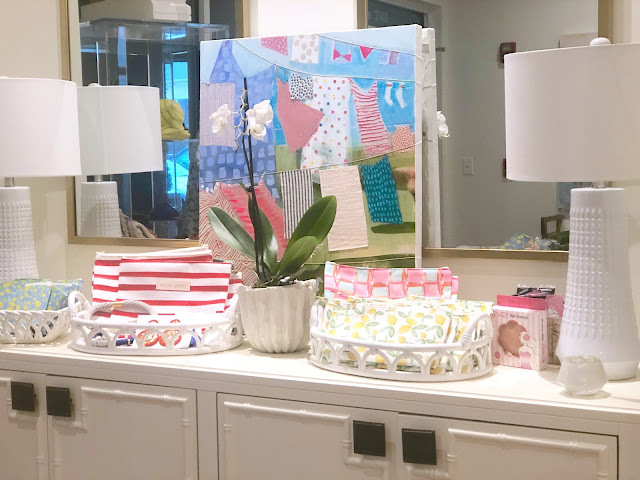 I always do this when I'm getting ready to do any space because I feel like it is a great way to collect all your ideas in one spot and it also helps with looking for trends in things that catch your eye. 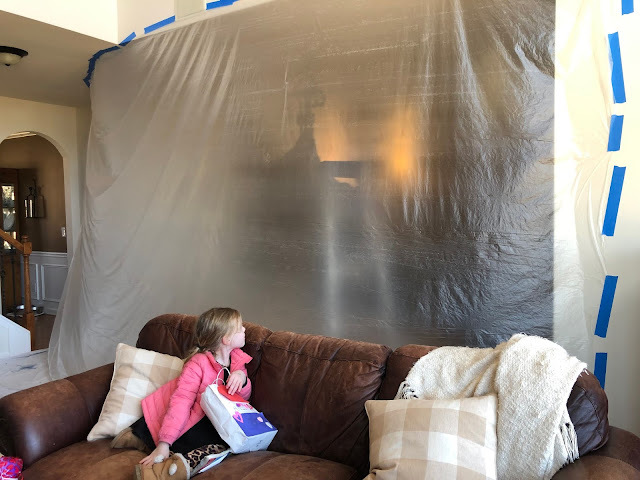 She originally wanted to do blush pink and black with gold accents, but that would mean repainting her walls and that is something I really didn't want to do. So, we started talking about other color combos and she decided to go with aqua/teal and peach/rose gold. I love it! 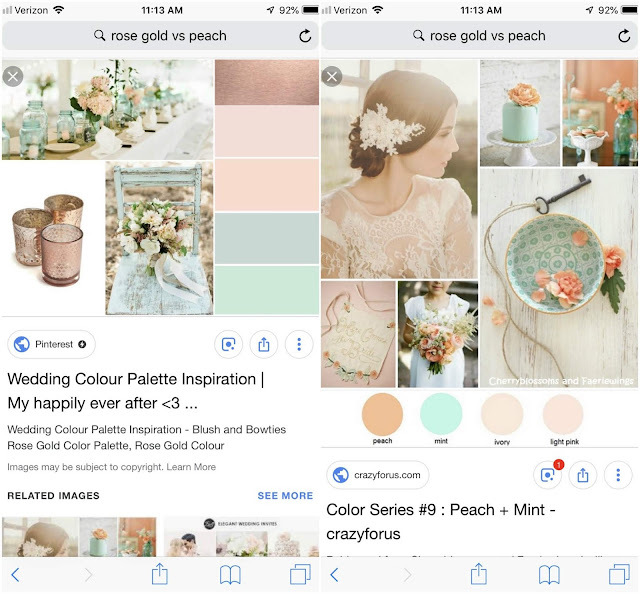 We found these two palette inspirations and went with it! Because we are buying some new furniture for Big Sister, that means Little Sister gets her hand-me-downs. Which also means we kind of get to do a mini-bedroom refresh for her, too! 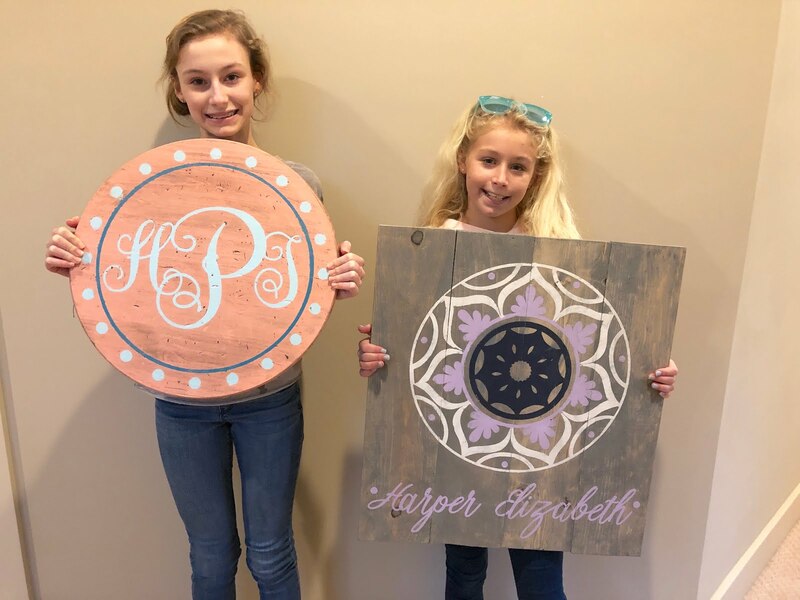 Last week I took the girls to Board and Brush to make signs for their rooms. They had so much fun loved it just as much as I did. Each of them picked something that is so very them and I was super impressed with how well their signs turned out. I couldn't wait to come home and look at everything together. I'm pretty sure I jumped up and down when I saw how perfect it was all going to be. While they were off school last week though I knew I wanted us to complete one little DIY project with Big Sis that she had found on Pinterest. She is all about plants right now. 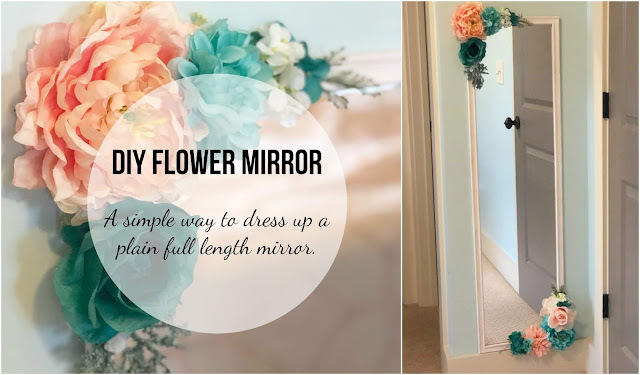 She wanted flowers, plants and succulents to be incorporated in her room and found a cute idea to dress up a plain full length mirror. 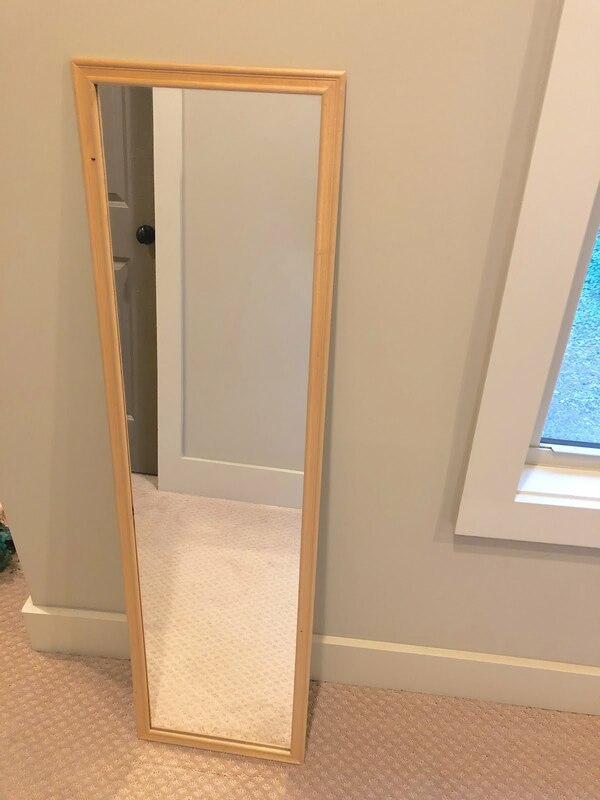 I'm pretty sure this mirror is one that was mine in college and was just as plain as it could be. 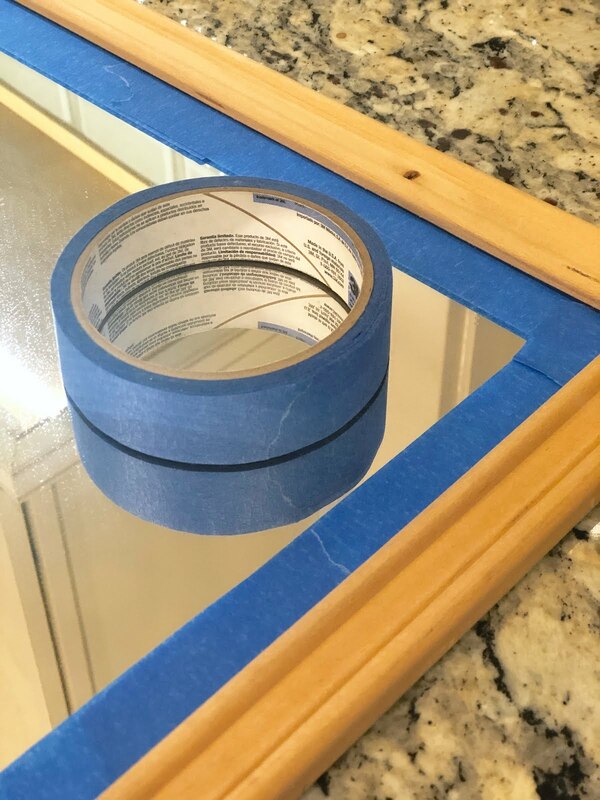 First up we taped off the mirror part so we could paint it white. Then she picked out two bouquets of artificial flowers that matched the colors she wanted it use in her room. 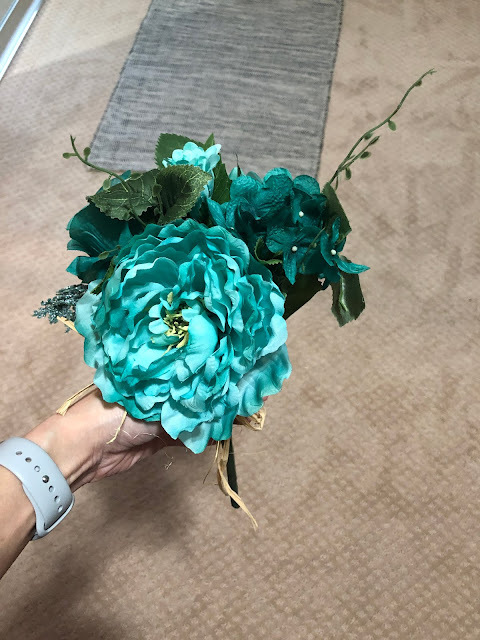 We pulled off all of the flowers from the stems (Tip - the usually pop right off if you give them a little tug) and just had to snip a little of the extra plastic off to make them flat on the back. Then I just used hot glue to attach them to the opposite corners of the mirror. So easy and dressed it up so nicely! 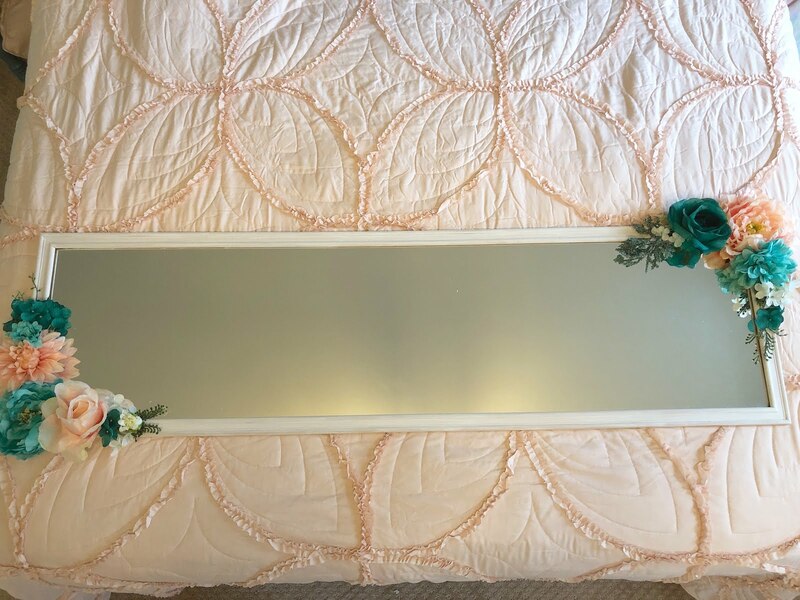 Here it is laying on her new bedspread (still waiting on her headboard to arrive), but I think the colors look so pretty! For now I just have it sitting on the ledge of the baseboard in her room, but may use these Command velcro strips to hang it once I know where everything is going to go in the room. I asked Little Sis if she wanted to do something similar to the full length mirror in her room and she gave me a quick, "no thanks" without even hesitating. Just made me laugh because those two couldn't be more different. 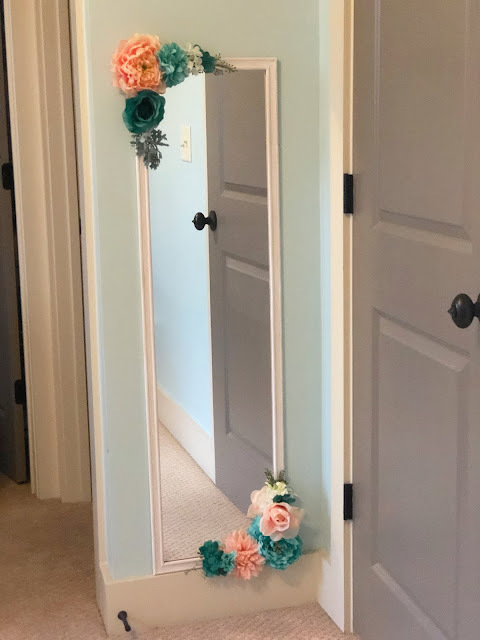 I have a few other projects happening for both of their rooms and can't wait to share the finished products as soon as it all comes together! Currently my house looks like a construction war zone. I'm living in a cloud of dust and the constant noise of power tools. But I don't care. This means our kitchen renovation is FINALLY underway! Hallelujah! 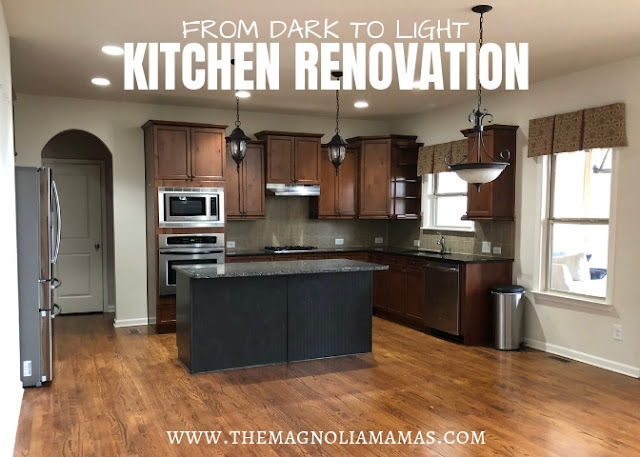 We've been chatting about a kitchen renovation for years! 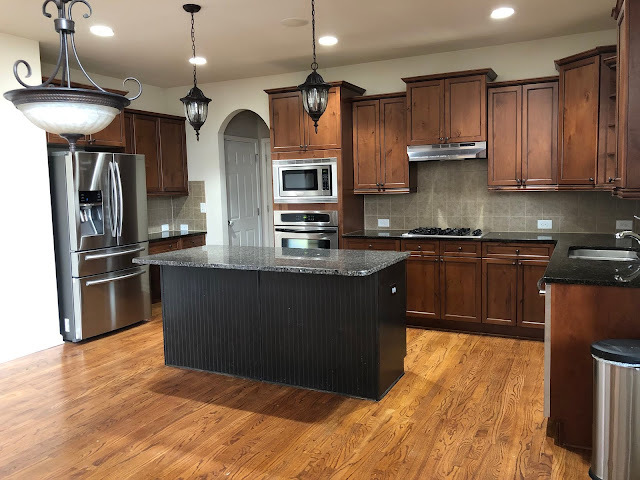 I am so excited that the time has finally come to say goodbye to our dark mis-matched kitchen and say hello to something lighter and brighter! Our old kitchen wasn't completely hideous. There were just a few things about it we didn't like. Not to mention it was super dark. And even that really didn't bother us until we built our screened in porch a few years ago. The extended roofline of the screened in porch and the fireplace, blocked a lot of the daylight coming into the house. It felt dreary and dark, and with the amount of windows we have in this place you know that's not our style. So, we're hoping to lighten it up to make it seem brighter. And to bring a few things up to date in the process. Our inspiration has come from a lot of Pinterest searching. Check out our "Dream Kitchen" board - I seriously could get lost looking at all those swoon-worthy kitchens. Exchange single oven for a double oven. Change wasted space at mail center into more cabinet space. Exchange a dead space in the kitchen for a microwave space. Add a larger single basin sink. Add a larger more functional faucet. Add a serving cabinet to dead wall space. At the end of January we secured our contractor and now we are about half way through the remodel. Here's a little peek at how the process has gone so far. Packing up the kitchen took a good three days. I never realized how many things we were storing that we never used! Marie Kondo would be proud because I got rid of a ton! My husband however undid some of my Kondo-ing. Second to shiplap the renovation would be over if I touched his cup collection. Not. a. single. cup. We did find some fun goodies in the mix of it all. At least I know we had a cup or two to drink it from. 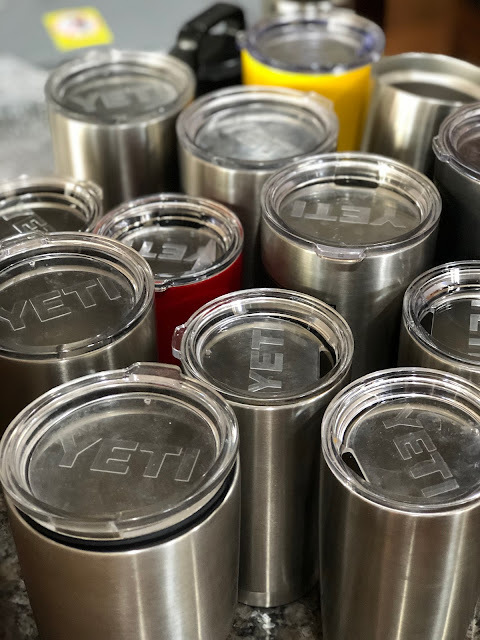 Before the demo crews showed up, our contractor sent us on a shopping spree to get certain items on order. We knocked out countertops, and all appliances in one day. 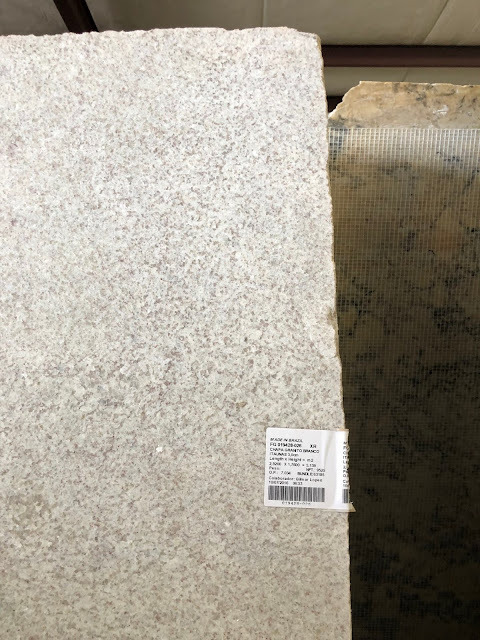 We chose this granite, but having a meeting tomorrow to finalize because we think coloring might be off now that things are in motion and we see "the big picture". Stay tuned. 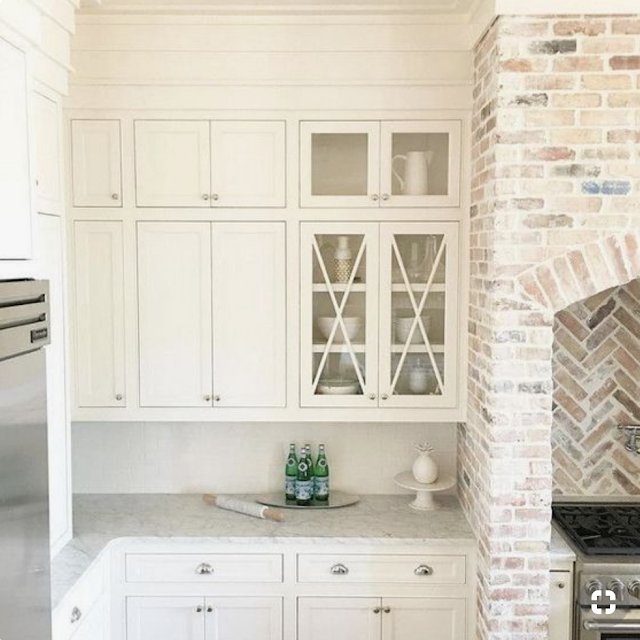 We chose our brick color and then went through 1,859 shades of white. 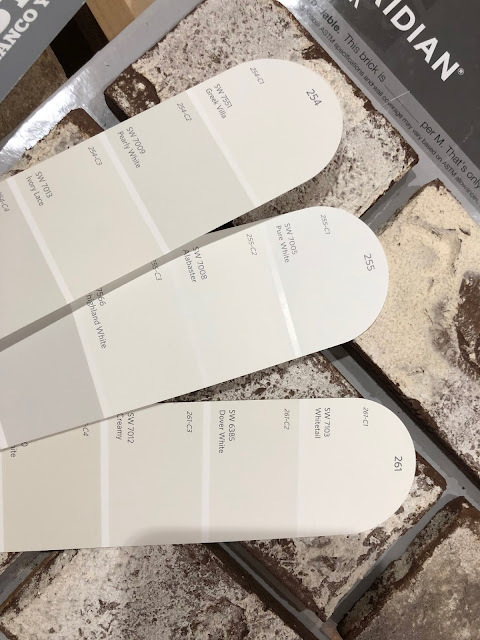 Our brick color is called Old Dominion and the white we chose is Sherwin Williams Westhighland White. Once demo started our house was an organized mess. 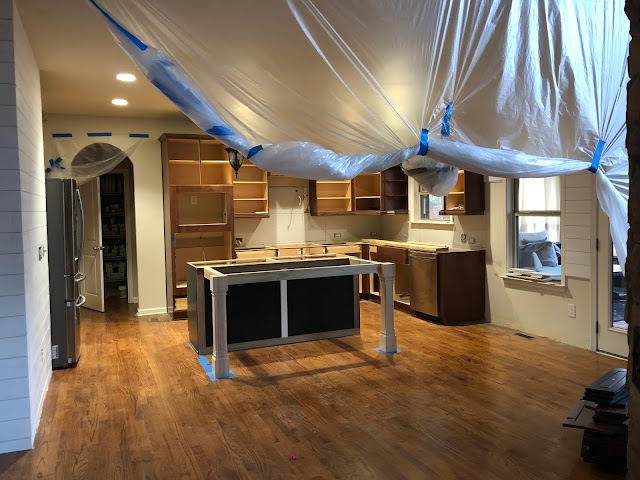 The contractors taped off the kitchen to try to limit the amount of dust getting to the rest of the house. The kids thought it was hilarious. The dust however...it still manages to make its way through. 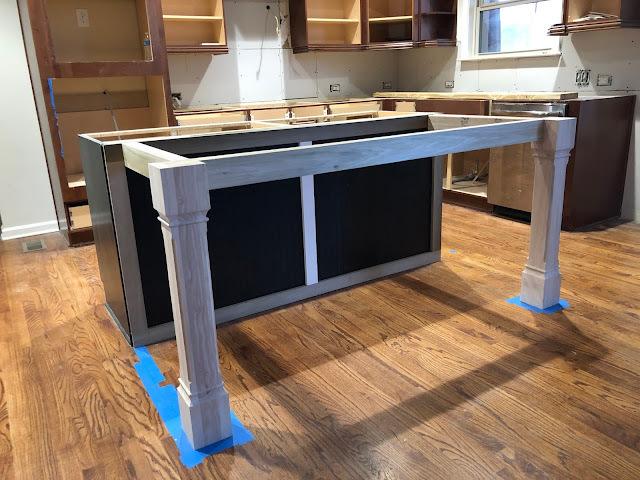 With in a blink of an eye everything was torn down to the cabinets we were keeping, and then we got to choose what little touches we wanted to add here and there with corbels and island posts. We went with the square leg. 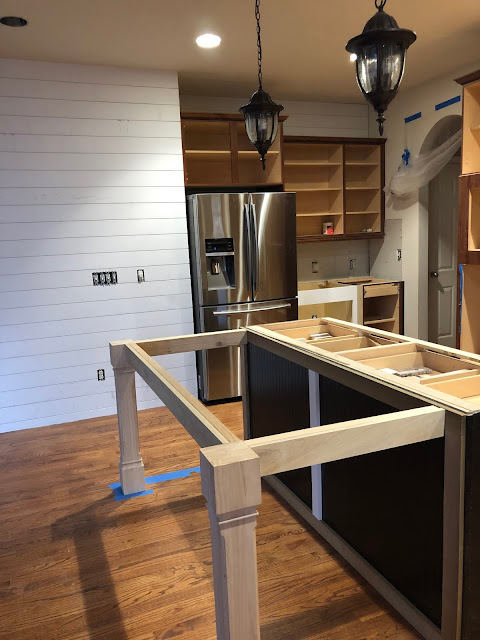 The shiplap started going up and the husband was living out all his HGTV dreams. I also never realized how many different options there are to put shiplap in your home. I'm not sure I ever wanted that knowledge, but the hubby is happy so we are all happy. The island got modified. We are extending it by about three feet and the posts are in place ready to go for the granite. We went on vacation and came back to a fully sanded and painted kitchen. We were so excited to see it kind of start to resemble what we had envisioned. Not to mention it already looked much brighter. We only had to make one tiny decision while we were gone. We decided to add back the antiquing we had on our original cabinets. 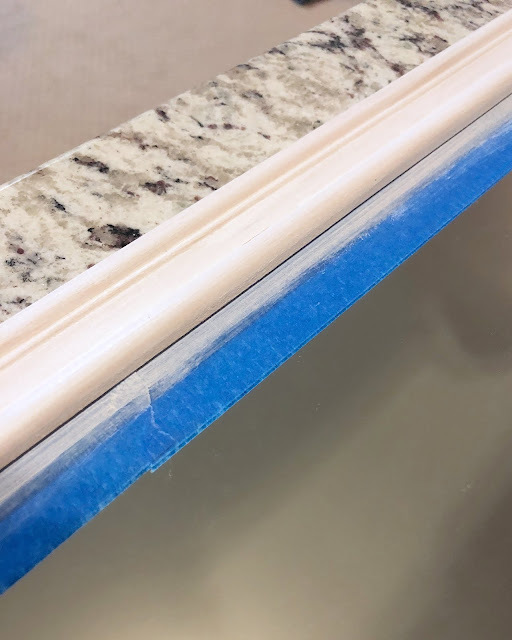 The contractor asked us to choose a color and a line style we liked. I'm not going to lie, internally I was hoping he chose a better "colorer" for the final product. The blank wall will have a custom cabinet added to it. We're still waiting for it to be finished. They started the brick wall and backsplash yesterday and I am so excited! The thing I hated the most about our old kitchen was the tile. We could have just done this and I would have been happy. 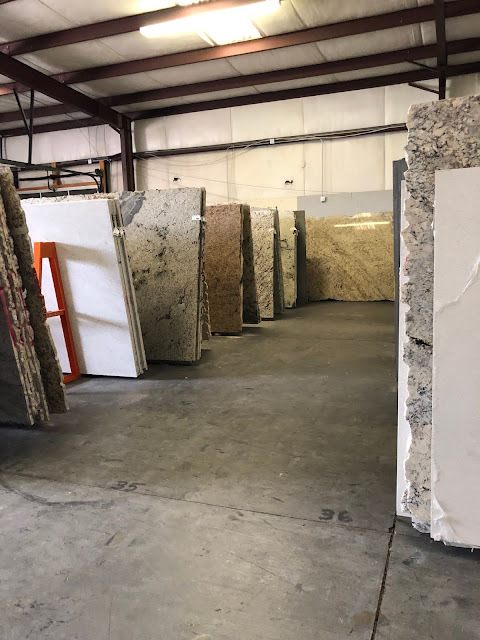 The rest of the week will be focused on the brick, continuing the cabinet modifications, and finalizing our counter tops. I'll share another update soon, but hopefully only a few more weeks and I'll be back to making dinner for everyone again. Happy Friday Friends! 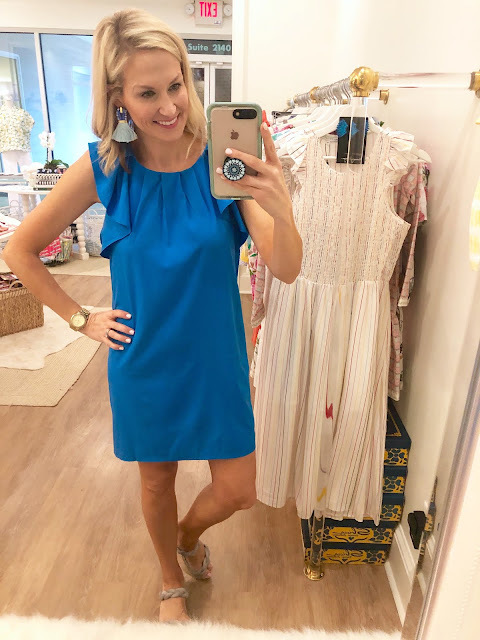 We've been on winter break this week and while Jen has been soaking up the beautiful weather in sunny Florida (check out all the fun they are having on Instagram), I've been trying to stay afloat with all the rain we are having here in Atlanta. It has literally rained every.single.day and been super cold, too. We are beyond ready for warm weather and so ready to start wearing all of our gorgeous spring and summer colors. Yesterday I got to sneak over to Willow Park Boutique to check out some of their new spring and summer arrivals. Oh my goodness, y'all! I need to to get warm ASAP because I was so in love with all of these finds. 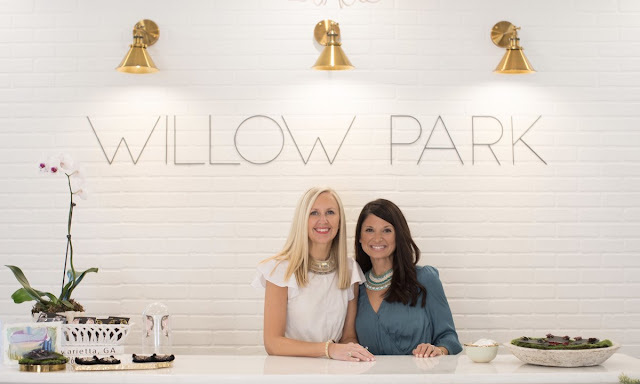 For those of you not familiar with Willow Park, it is owned by these two gorgeous ladies and they have a huge following on Instagram as an online boutique ! 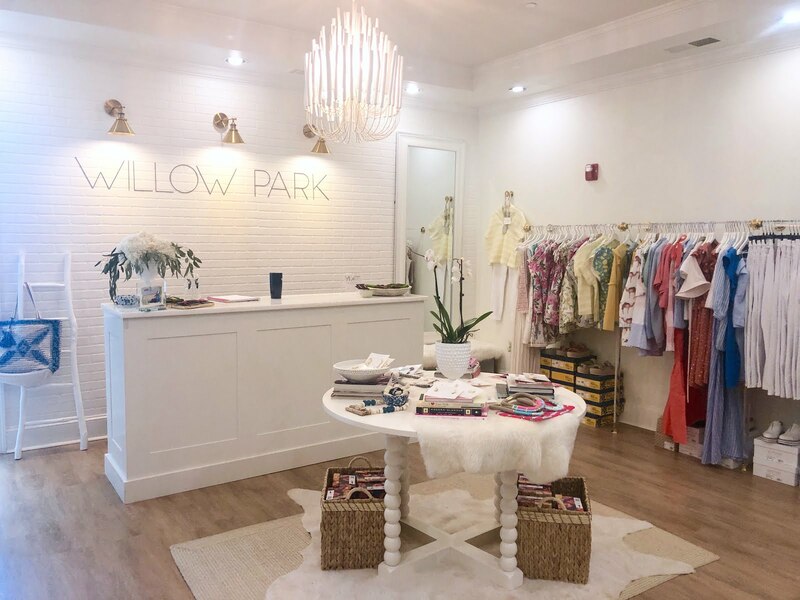 They pride themselves on having a collection of timeless styles, bold statement pieces, and one of a kind finds that you won't find anywhere else. Basically all of their pieces are just beautiful additions to a well collected closet. What some people don't realize is that they also have a store front with limited styling hours. I'm lucky enough to be within walking distance to their store and I don't know if that is a good or a bad thing! I love shopping online, but there is something about being able to touch, feel and try on gorgeous clothes. I loved every.single.thing I tired on and couldn't wait to share it with all of you! I'm wearing a small in pretty much everything and would say it all fits true to size. First up are some really precious tops. All of them are paired with the white Spanx Jean-ish ankle leggings. These are awesome. Y'all know we love our faux leather Spanx and these white ones look like jeans, but feel like leggings and are a must have for spring and summer. Also, these braided rope platform wedges are the shoes I wore with every outfit. I love that they matched everything and they are SO comfortable. I just bought a different pair of wedges that I'm returning so I can buy these because I loved them that much. This darling lavender top with a ruffle neckline and bow on the back won me over at first sight. 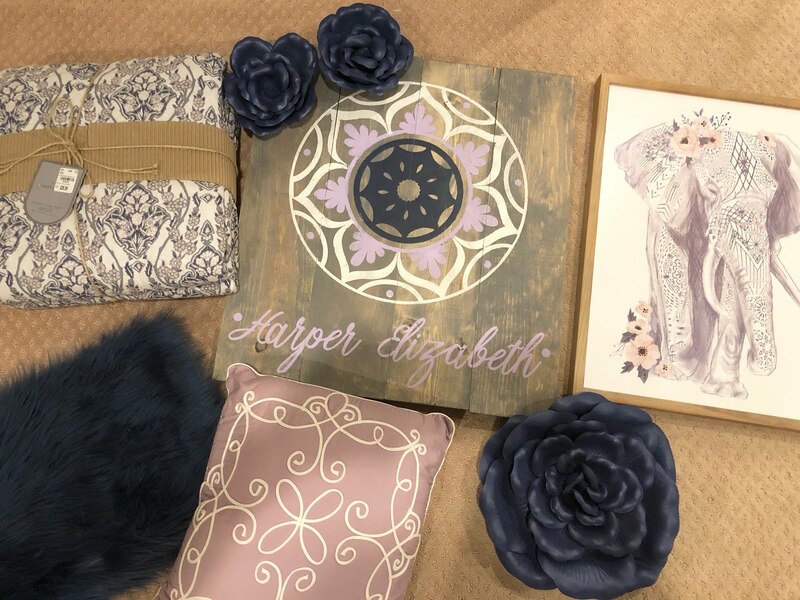 The color is just so pretty for spring and really different because I don't feel like you see a lot of lavender items for women. It looks great with blondes and brunettes and was just so flattering on. 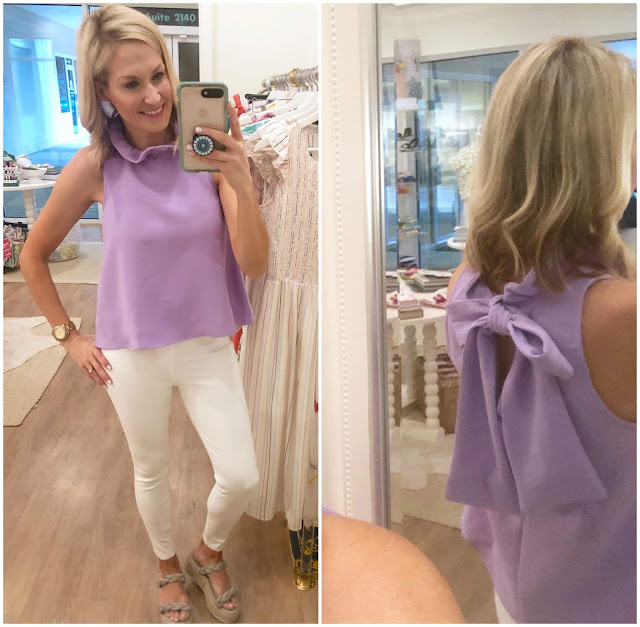 Next up was this super cute ruffle tank. It is a really pretty orangish-red color. This is the only one I wore an XS in because it ran a little large. The woven fabric was so lightweight and breathable so it would be just perfect when things warm up. I loved the ruffle detail and also think this one would be cute with denim shorts. I'm wearing it with the most fun oyster shell earrings made from REAL oyster shells. This top was too cute! 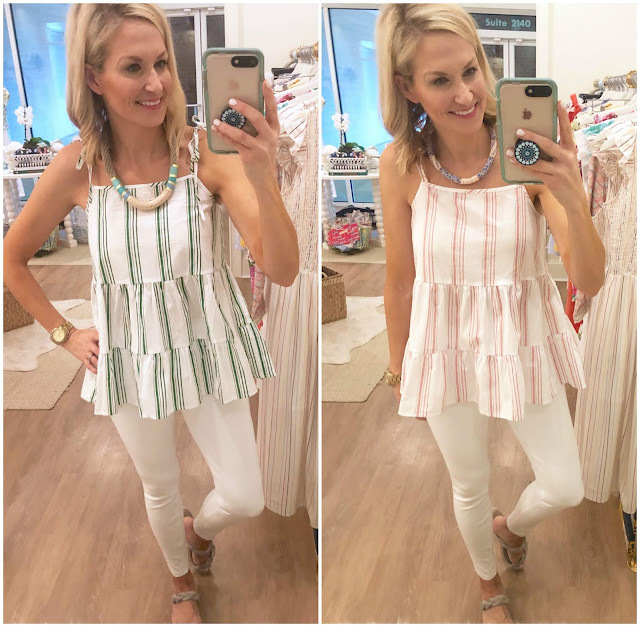 This look was a nice twist on an all white outfit and the top comes in both a green and pink stripe. The green would be so fun for St. Patrick's Day! I loved it with the white Spanx, but also feel like this would be perfect with a pair of denim shorts or white shorts for the hot summer days spent at the baseball fields or for a cute beach outfit. I loved the fit of this tank and that the ties on the shoulders are functional so you can make it as tight or as loose as you need. After all those fun tops I moved on to dresses. Every single one they have in their store was so beautiful. The fabrics were light, the cuts were stylish, and the colors were amazing! The first up was this white smocked maxi dress with multi colored stripes. 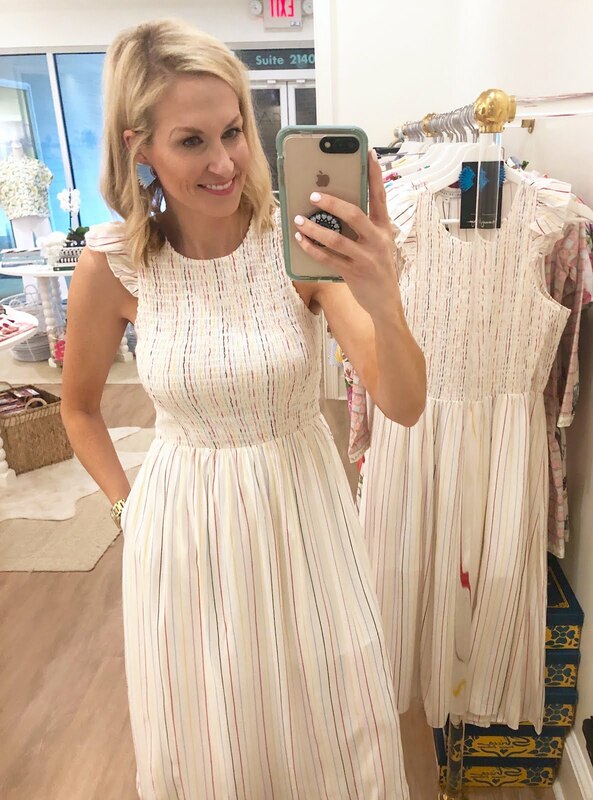 This is the perfect spring and summer dress. It would look darling with a denim jacket over it for spring when the temps are still a little cooler. The stripes are so vibrant and it would be fun paired with lots of different colored jewelry. The possibilities for this one are endless! 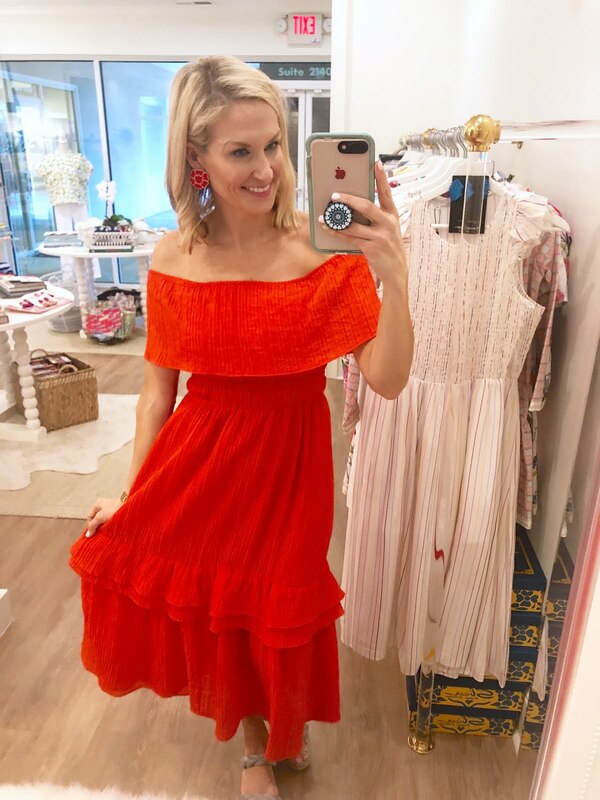 This orangish-red off the shoulder dress is made from the same material as the ruffle top above, so it was light weight and had great movement. This dress made want to go salsa dancing...and I don't even know how to salsa dance. It was just so fun! I need to book a spring break trip pronto so I can wear this one! Of all the things I tried on this was probably my favorite. I just loved the color and the fit of this dress. It had the sweetest details on the neckline and I love ruffles so the sleeves won me over. The material is kind of silky so it just felt great on. 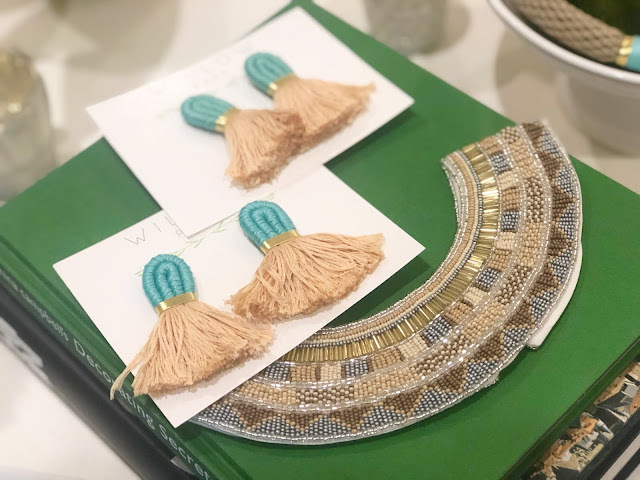 I wore it with the wrapped tassel earrings which were so lightweight that they surprised me. Most big statement earrings hurt my ears, but these didn't bother me at all. I left with a few goodies in my shopping bag and have my eye on a few more. I can't wait for this weather to warm up so I can start wearing them all. Be sure to check out our Instagram stories a little later today because I'll be sharing try-on videos of all these pieces and also be sure to follow Willow Park Boutique because they are constantly adding gorgeous new pieces to their site and they always have the best try-ons and tips for pairing outfits and jewelry. Hope everyone has a great weekend!!! Amazon lovers unite!!! We have been long time lovers of Amazon, but they have really stepped up their game and now we feel like we find SO many amazing things there. Best of all, if you are a Prime member...it arrives on your doorstep in two days and most things we find are SUPER affordable. Think less than you would spend taking your kids to Chick-Fil-A. 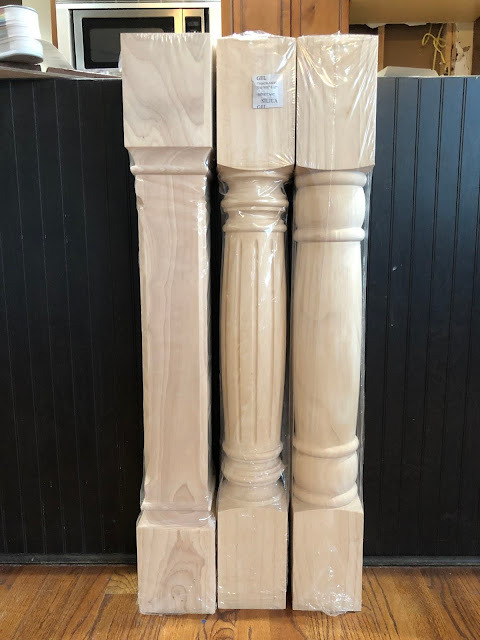 We have both gotten so many great items recently and have gotten tons of questions in real life about them so we wanted to share our finds with all of you, too! If this is something y'all enjoy we're thinking about making it a monthly thing. Most of what we found this month were items that we feel like we could wear now and into spring. We are just over the cold weather, tired of wearing boots and heavy sweaters and ready to start lightening things up with our wardrobe. Unfortunately, the cold weather continues here in Atlanta, but we are hoping to will it warm with our wardrobes! Jen and I both bought a pair of these blush pink Nike shoes and I immediately set out to find all sorts of things to wear with them. Kind of opposite right...to plan your outfit around your shoes, but I just LOVE them so much. 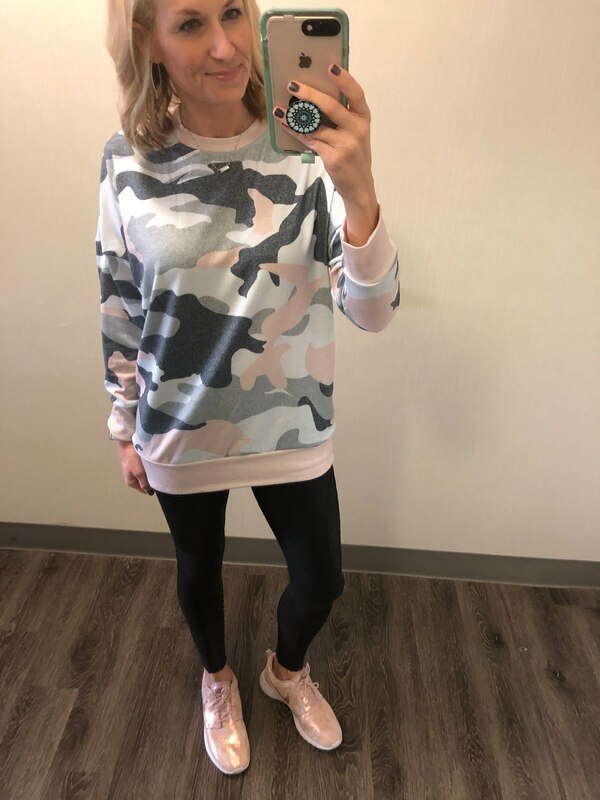 This camo sweatshirt was a definite winner. 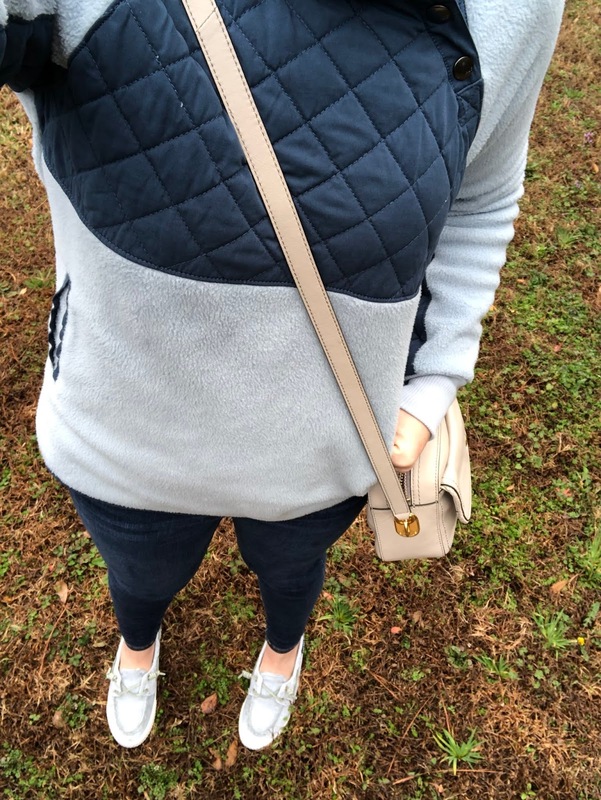 It's called a sweatshirt, but it is actually really light weight so works well now and is something I can wear into spring, too. It comes in several different colors. I'm generally between a small or medium in tops and got the medium in this one because I wanted it long enough to wear with leggings. LOVE it! 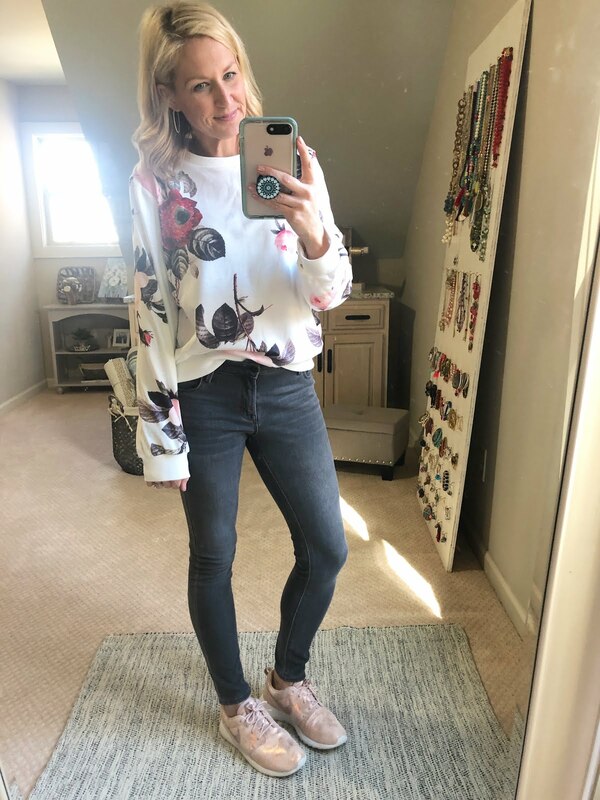 This floral sweatshirt is another one I bought specifically to wear with these shoes. It works well now with jeans and I can see wearing it into spring with my favorite denim shorts. It's the same lightweight material as the camo one above so great for now and for when it warms up a bit. Sticking with the same lightweight sweatshirt style...I saw this one and HAD to have it. It's no secret I love all things leopard or animal print, so had to have this one. It fits very similar to the camo one, but I got a small in this one because I wanted it to be shorter to wear with jeans and shorts. 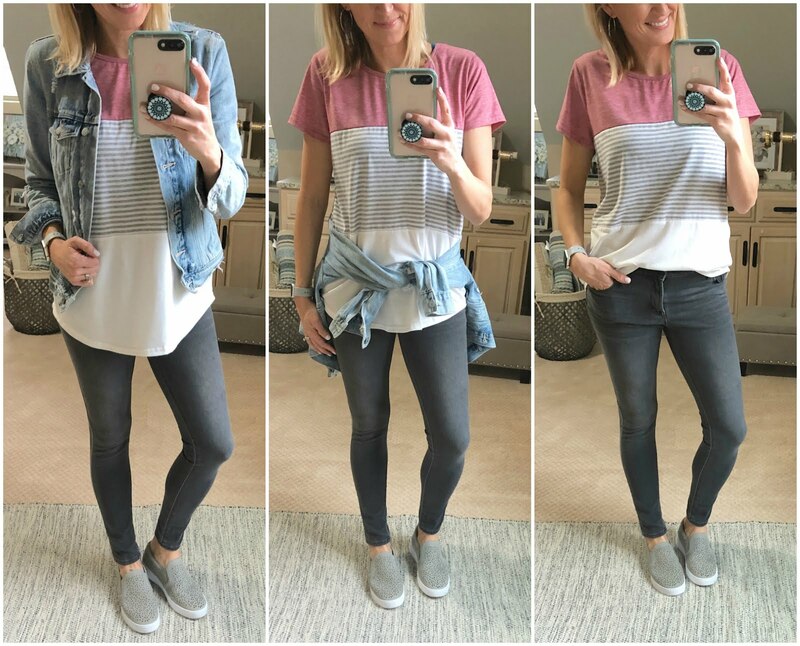 This color block t-shirt is SUPER soft and comes in several colors. I'm wearing it with my favorite gray jeans. It works now with a denim jacket and later into warm weather worn alone. It's a longer length so also good with leggings if you size up. We shared all about our favorite silk pillow cases and why we are sleeping on them. I posted this picture on Instagram and got tons of questions about my shirt! 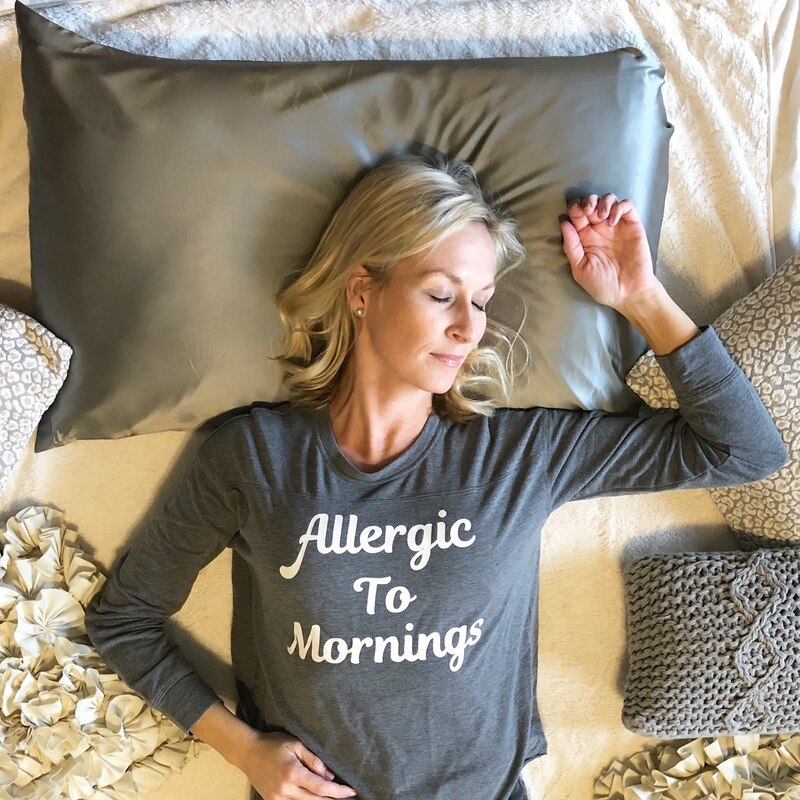 The long sleeve is sold out, but here is a short sleeved option that comes in several colors! 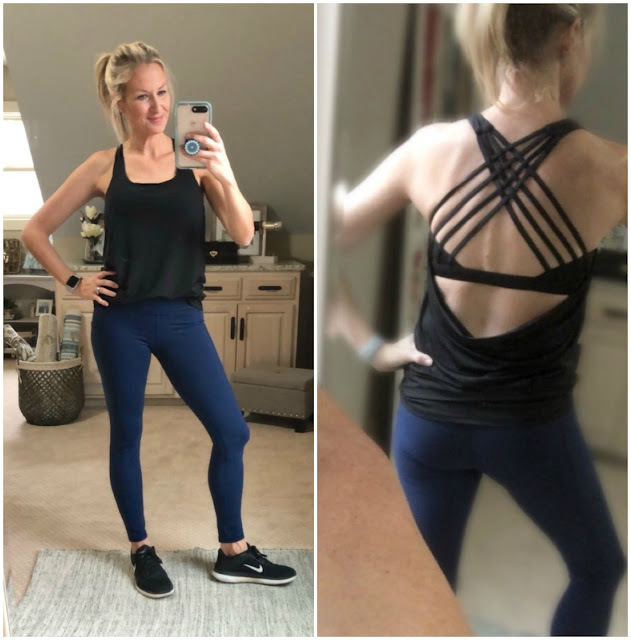 We did an entire post on our favorite workout wear (you can find that HERE), but these two items were our Amazon favs. The best leggings ever and this super cute workout top. Both under $20! Where are all the baseball moms at??? Spring season is here and I'm so very excited. 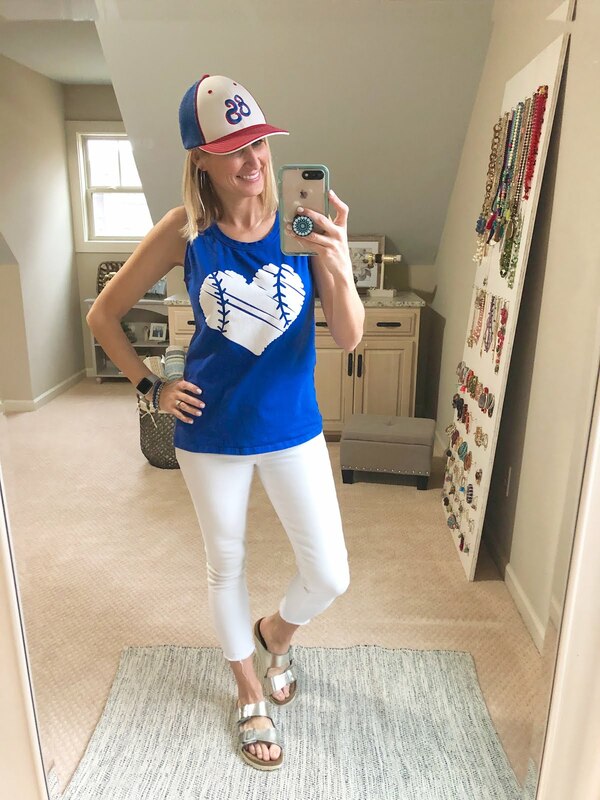 I can't wait to cheer on those sweet boys and I got a few new tops to wear to the ballpark. These both remind me of something I could find on Etsy, but with the great price and convenience of Prime shipping! This baseball heart tank is a stretchy cotton fabric and comes in both blue and red. This Play Ball tank is SUPER soft...I want to wear it all the time. Even when it isn't a game day. 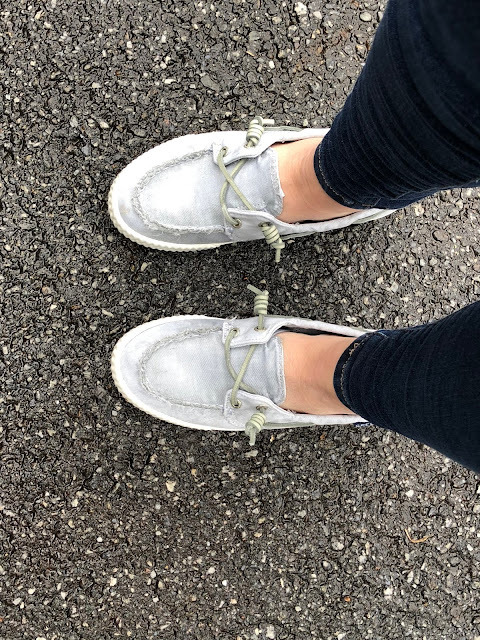 I've always had good luck with Sperry shoes so when I found these Sperry sneakers I had to give them a try! They are really comfortable and feel like they will be a great transitional shoe taking me from winter straight into spring! 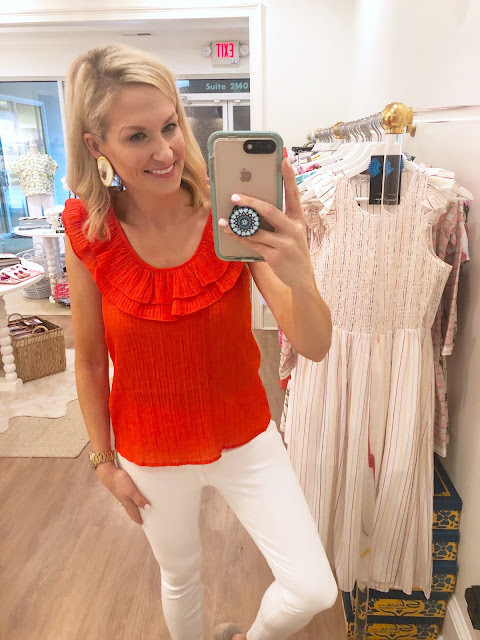 Like Carrie Beth, I wanted to lighten up my wardrobe a bit and this pretty color block tunic sweatshirt was a total winner. It's super soft and comes in several colors. It's a great length to wear with jeans and the length would also work with leggings. These white perforated sneakers are also a great shoe for making my outfits look just a little more spring and are super comfortable! I've been on the hunt for some great white distressed denim shorts. The hunt is OVER!!! 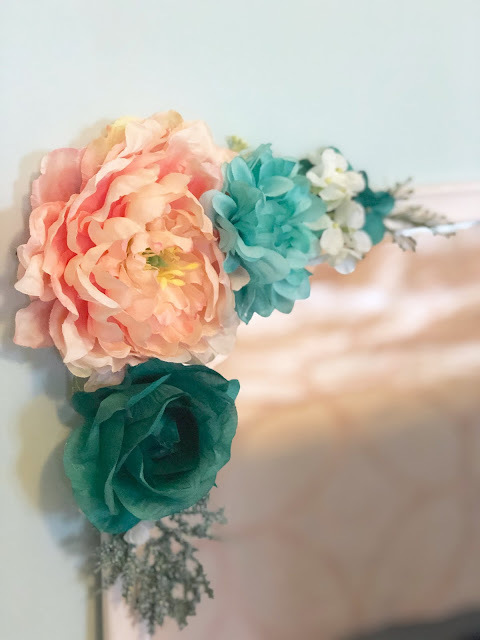 I love these and can't wait to wear them all spring and summer long. They feel very similar to our favorite denim shorts from last summer. This short sleeved terry cotton shirt is amazing!!! So comfortable and I'm totally getting another color. 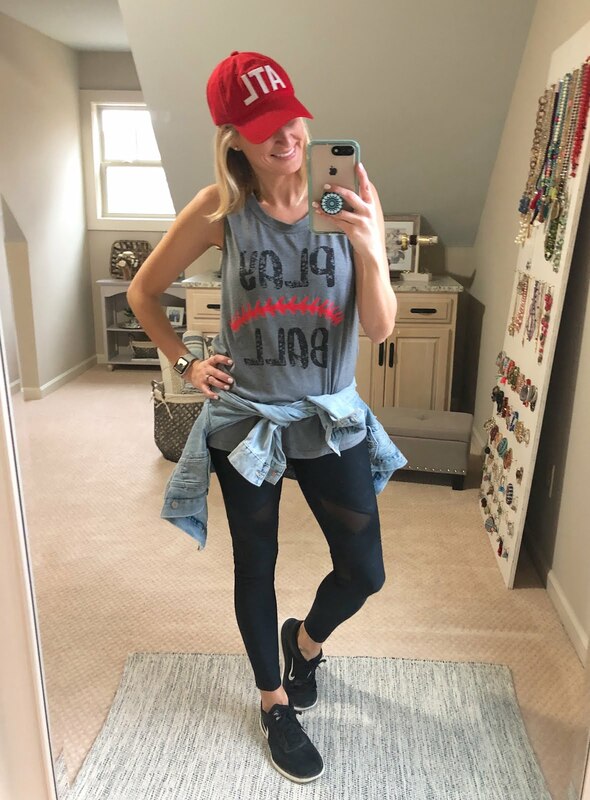 It's super casual, but easily dressed up with a fun necklace and helps me look put together, but still able to live that mom life and keep up with my kids. So there you have it! Our amazing Amazon finds from this month. Let us know if this was helpful and if you want to see more Amazon posts. We can assure you we are going to keep shopping and already our eye on a few things!